It's early… not that early but normal waking time for a school day. It's one of those rare Saturdays around here where we don't have anything to be up for in the morning - no gym, no t-ball, Daddy didn't have odd hours where his sleeping didn't match normal sleeping hours. It's one of those mornings we don't have to be out of bed right away but the littles of course don't understand this kind of morning. Sooner than we'd like the biggest of the bunch is awake and that's usually Micah's cue that he's starving (said while rubbing his belly) and we've clearly forgotten or are choosing not to feed them breakfast that day and he's very distressed about it. 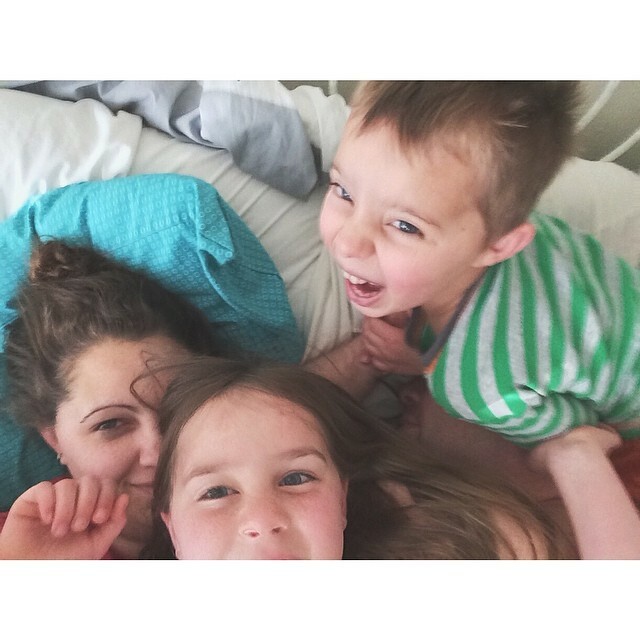 Micah being in our room, means everyone has now come in and piled on the bed… because it's family cuddle time…. which quickly progresses to tickle Daddy time. (I'm mostly exempt for this game because lucky me I'm hardly ticklish and Daddy is just oh so ticklish) It's all fun and games while Abby and Micah gang up on Daddy and Lexie jumps in and out of the fun as well. She likes the sitting on top of us part and sometimes pretends to try and tickle us too. Then Daddy ruins the fun by getting a hold of Abby and she dissolves into a crying fit because he's "hurting" her by holding her in between us (gently of course!) but it's only really hurting her feelings because not 2 seconds after she is released she is giggling and attacking Daddy again. Two minutes later, Mr. I Now Know How To Make A PB&J Sandwich has gone downstairs and taken the liberty of making pb&js for all 3 kids because clearly when we asked for 5 minutes to decide on breakfast and hadn't done anything about it two minutes later we were back to not feeding them at all today. So pb&js for breakfast it is I suppose. Well until brunch….. and yes even with brunch they'll still want lunch an hour later.